If you are like me, just a slight talk about Komodo Island trip sparks a whole new dream of adventure. The Komodo National Park, Flores, where this island is located in, has so much to offer. It’s one of the 7 Wonders of Nature that’s very rich both in land and under the water. Along the Flores Sea lie a series of tumultuous islands that look like what’s left from Jurassic Park. The pristine beaches and clear water seems like they just fall from heaven itself. And among these raw beauties, the ancient Komodo Dragon crept on its land. It’s no wonder if you want to embark on solo travel to this beautiful Indonesia frontier as soon as possible. If you are planning to do so, I have some little tips that might be useful on your vacancy. As told you before, Komodo Island and all the islands in Komodo National Park hide so many beautiful gems. With so much to see, plan how many spend you’d like to spend in the area. Will it a day tour, 3D2N, 5D4N, or a week-full tour? 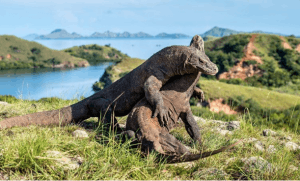 Which Komodo Island trip suits you the most? Plan all island you wish to visit and adjust later on with the tour agency. Most of Komodo Island trip were made for group. It’s still possible to hire a wooden boat or speed boat just for a single person, but it can be very expensive. The best thing is looking for an open trip and see if they have a slot for you. This way, you don’t need to pay all the expenses by yourself—the price of the boat and tour is split evenly among all the passengers. They usually have a fixed rate per person and will let you know beforehand. Without travelling partners, you got no one to share the travel expenses, especially lodging and land transportation. Especially in a difficult landscape like Flores, where almost every chauffeur and ship owners are reluctant to take a single passenger on board. There are four options to get into Labuan Bajo, Flores. First, you book a direct flight from Jakarta (the capital city of Indonesia). Second, take a direct flight from Denpasar, Bali. This is very convenient if you are currently in Bali and get interested to go to Flores or planning to spend some time in Bali first. I highly recommend you to take one of these options. It can be a little bit pricey, but it’s very comfy and saves a lot of your valuable time. The third option s taking a ferry from Bali to Komodo Island, which is the cheapest option among all. However, I gotta say that this kind of Komodo Island trip is not the comfiest. It also very time consuming and the route is hard to navigate as well. It’s adventurous, indeed, but you might have little energy left when the ferry finally dock to Komodo Island. Option number four is kinda similar to the previous one. Take a ferry to Lombok, and then fly from there to Labuan Bajo. This way, you can have time to see the famous Gili Island without having to embark on dangerous route the entire way. But still, I recommend you to take the plane flight. Bali, Lombok, and Flores each has their own airport and provide a direct flight from one to another. And make sure you land on Komodo International Airport in Labuan Bajo—Flores has two different airports. For avid solo travelers, this should be a no brainer. With a lot of budget already goes to transportation, it’s best to pick hostels instead of hotel in Labuan Bajo. This is also a great opportunity to find a travel buddy for your Komodo Island exploration. Who knows, you might meet a bunch of other solo travelers and persuade them to join on your Komodo Island trip together! Travelling alone, you got no one else on your back to deliver recent news to family and friends back home. In a frontier like Flores, it’s best to prepare with two different local SIM Card providers. In case the one that you are using lose the signal, you still have another one to try.